We know getting experimental with guacamole upsets some people (looking at you pea guac) but when something is this delicious, we're willing to take the heat. 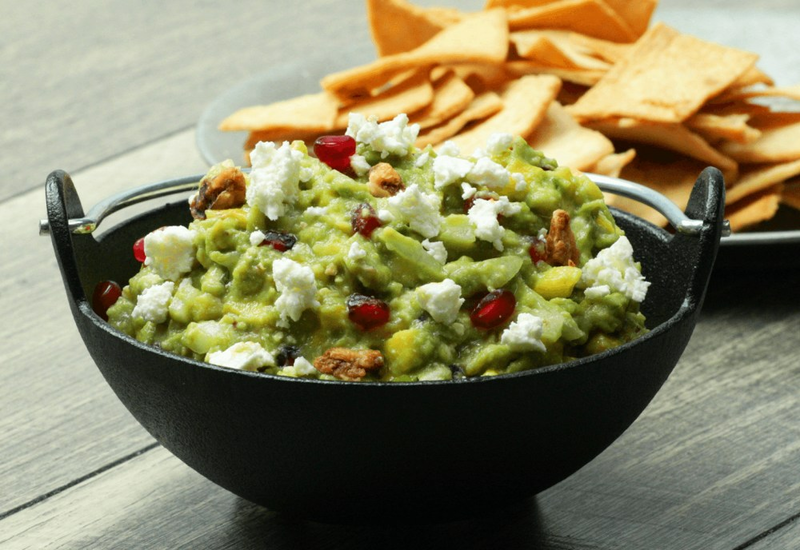 Here's a creative guacamole recipe that's jazzed up with—you might want to sit down for this—candied walnuts, pomegranate seeds, and feta cheese. You still with us? OK, hang in there. The add-ins give the guacamole such a great texture, it's a revelation and life is about little surprises now and then. Is this version traditional? Not at all. But is it good? You betcha. Want to make this guacamole super instagrammable? Reserve small portions of the pomengrantate seeds, walnuts, and feta cheese to use as garnish. Of course, you can serve the dip with tortilla chips. You could also go with raw vegetables and pita chips. Per Serving: 120 calories; 10g fat; 9.1g carbohydrates; 2g protein; 2mg cholesterol; 167mg sodium. I was dubious about putting mango, orange juice and pomegranate in my guacamole, but I'm glad I tried it. It's a definite new twist on a good standby. This was surprisingly delicious. The orange juice gave it a citrus-twist, and the walnuts added a good crunch. Good fall recipe. I thought I wasn't going to like this recipe, but it was surprisingly delicious. I guess avocado is just good with everything! This recipe is a must try! This guacamole-style avocado dip was easy to make. I wish I had let my avocados ripen a little more, so that it would be easier to mash. But other than that small hiccup, it was really quick and simple. I served it with a vegetable crudité and pita chips at my house warming. I skipped the mango and pomegranate seeds, and added everything else. Also, 2 tablespoons of feta cheese was not nearly enough for me, I doubled that amount because I really really love feta. Great tasting dip and easy to make.